"DENTAL WARRANTY OF SILOM DENTAL BUILDING"
replace or repair the same material type of implant fixtures at no cost during 10 years. replace or repair the same material type of veneer, crown and bridge , denture including crown on implants at no cost during 2 years. replace or repair the same material type of filling at no cost during 6 months. The patient must keep the prescribed regular recall appointments (minimum 6 months) for routine professional examination, X-rays and Cleaning at our dental offices or your local dental offices. The warranty is ineffective if our instructions are not followed properly. The warranty is ineffective if oral hygiene is neglected. The warranty is ineffective if a patient fails to present for an annual control examination. The warranty cannot be applied to temporary restorations, healing abutment and cover screw. The warranty is ineffective if a patient has gum or periodontal disease for which we have not provided the gum treatment. The warranty is ineffective if an illness is present, which has an unfavorable effects on the mouth (e.g. diabetes, bruxism, epilepsy, osteoporosis, after-condition excessive X-rays or chemotherapy). The warranty is ineffective if the denture is not used properly. The warranty cannot be applied to unforeseen root canal treatment. The warranty cannot be applied to naturally declining gum tissue or tooth bone. Refund is not part of what we warranty. To invoke the warranty you must contact our clinics immediately and before taking any other action. We do not reimburse overseas dental expenses made by other dentists back home post treatment nor do we reimburse travel and accommodation expenses traveling back for our warranty claims. We do not take responsibility for prior or continual dental works done by your dentists back home. The local warranty also does not cover damage of dental works caused by or related to other dentists work done post treatment. This warranty will not cover the implant fixture claim that patient has done the prosthesis part ( crown, bridge, hybrid and overdenture ) from other clinics. The NobelProcera Product Warranty covers all NobelProcera consumables (excluding temporary acrylic restorations) and guarantees product replacement at no additional cost. The warranty extends to restorations on non-Nobel Biocare implant systems: in case of implant failure, the customer will receive one new NobelReplace implant by Nobel Biocare and the corresponding new NobelProcera restoration. Medical device standards, biocompatible materials and industrial fabrication processes guarantee high-quality products with excellent precision of fit and surface finish for long-term clinical performance and patient satisfaction. NobelProcera provides certificates of material authenticity to both clinicians and dental laboratories on all products. 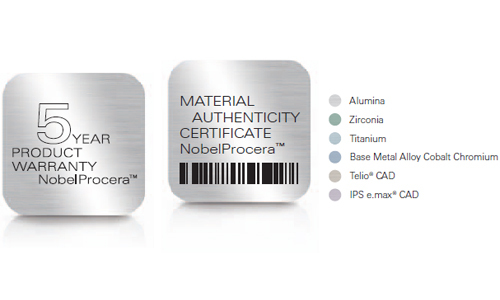 These authenticity certificates emphasize Nobel Biocare’s and NobelProcera’s dedication to providing dental professionals with biocompatible materials and proven alloys that meet patient demands for esthetics and functionality.